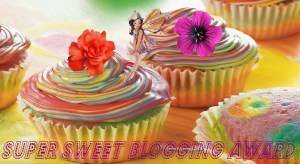 My little blog has been nominated for The Super Sweet Blog award by the equally sweet Yvette (AKA Strawberryquicksand). She leaves the loveliest comments and always makes me smile. As you know, I’m fairly new to the blogging game so I feel really humbled that she thought of me. Thank you! So now I have to follow a list of rules that go with this nomination which you can see below. Point one is that I have to say cheers to Yvette for the nomination (check) I have to answer a few questions about myself and nominate other people. Let’s do this thing! Cookies or Cake? – Cake, especially if it’s carrot cake. Cookies are good and all, but it’s just not in the same league as carrot cake.. Chocolate or Vanilla? – Chocolate. I adore the stuff. In fact, I’m pretty sure I eat so much of the stuff that it runs through my veins. Favourite Sweet Treat? – Hmmm this is a toughie, but I think it has to be cheesecake. When do you crave sweet things most? – After dinner, usually while I’m drinking a cup of tea. Sweet Nickname – I have so many nicknames, I’m not sure any of them are sweet, though! The Storm Brewing – I’ve nominated Sarah Jane for thus award because all her food looks amazing and always makes me hungry! The Jackie Blog – because there’s just something about Jackie’s blog that cheers me up just by looking at it. I don’t even have to read any of it before I start feeling better. That, and I think that Lollipop Tuesday is a great idea. My (dis)abled life. -I always really enjoy the heart-warming and honest nature of Ali’s posts.